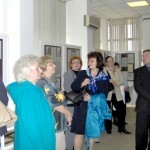 The documentary exposition “Women’s Movement in Bulgaria (1901-1950)” organized by the Bulgarian Association of University Women (BAUW) and the General Department of Archives at the Council of Ministers to celebrate the 80th anniversary of BAUW was opened on 27th May, 2005 in Hall “Archives” (5 Moskovska Str., Sofia). 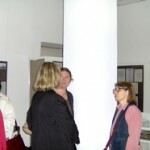 The exposition was compiled and arranged under the supervision of Assoc. Prof. Krassimira Daskalova and with the participation of Architect Dr. Luibinka Stoilova, Dr. Irina Genova and Dr. Georgeta Nazurska. They were helped by Stefka Petrova and Hristo Vekov (Archives State Agency) and by the painter Stoyan Hristov (Bulgarian Academy of Science). Archive materials from the collection of the Central State Archives and the State Archives, Sofia, documents and photos from private collections as well as books from the National Library “St. Cyril and St. Methodius” were arranged in 30 posters and 7 glass cabinets. 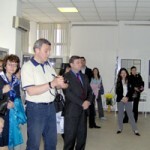 Such an exposition is organized for the first time in Bulgaria. The women’s movement has been the subject of previous expositions but either as far as the Revival Period in Bulgaria is concerned or in view of the socialist and the communist trends in this movement. 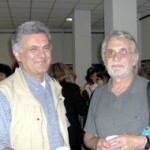 In the choice of the documents exhibited the organizers were led by the idea to represent the full scope, organizationally, ideologically and individually, of the feminist movement in Bulgaria. That is why the presentation of the period before the Liberation (1878) was limited to the brief sketching out of the birth of the first women organizations, the spread of the ideas of women education and the establishment of the first female schools. A number of posters represented the founding of the national organization of the Bulgarian Women’s Union (1901) and its split into two factions: bourgeois and socialist. Special attention was paid to the emergence of the suffragette union “Equality” and of the communist women’s movement up till the mid-1920s. One of the focuses of the exposition was the collection of print materials of the above-mentioned two movements of Bulgarian feminism as well as the biographies of their leaders (Аna Karima, Ekaterina Karavelova, Julia Malinova, Dimitrana Ivanova, Vela Blagoeva, Kina Konova). Together with a number of Bulgarian and foreign books which described the demands of women as a social group deprived of basic civil rights they formed the core of the exposition. 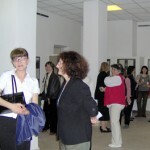 The larger part of the exposition was devoted to the development of the feminist movement in Bulgaria after the First World War. The documents showed the activities of the Bulgarian sections of the international pacifist and liberal organizations (the Bulgarian Branch of the International Women’s League for Peace and Liberty headed by Ekaterina Karavelova and Lidiya Shishmanova, The International Alliance for Women’s Suffrage and Civil Rights represented by Vera Boyadzhieva-Fol, the Bulgarian Slavic Women’s Group led by Sanda Iovcheva). A special place among all these organizations occupies The Union of the Bulgarian Women with Higher Education. It was founded in 1924 as an organization of the elite group of Bulgarian women university graduates and in 1925 it became a member of the International Federation of University Women. It combined the ideas of the social and the liberal international women’s associations (fighting for guaranteeing the right to education and work for all Bulgarian women) but in the course of time it became a supporter of pacifist and political ideas as well (for peace and women suffrage). It was representative for the Bulgarian intelligentsia, for the development of feminism in Bulgaria and for its subsequent destruction by the totalitarian regime. Several of the posters represented some of the leading figures of this organization (Ekaterina Zlatoustova, Dr. Zhivka Dragneva, Tiha Genova, Luiba Akrabova and Svoboda Chardafonova), as well as organizational documents and evidence of its activities. 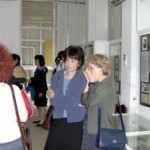 The archival material and the photos documented the active membership of such women pioneers in Bulgarian science and the humanities as the first assistant professors at Sofia University Teodora Raikova-Kovacheva, Dona Kalcheva, Maria Andreicheva Vankova, Assoc. 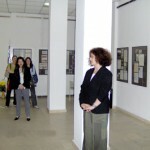 Prof. Dr. Elisaveta Karamihailova, Assoc. Prof. Zhana Nikolova-Galabova. Special attention was paid to the activities of the three sections in the Union – of the women graduates of the Law Faculty, who were deprived of the right to work as lawyers and judges, of the women painters and of the women writers. 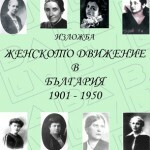 Such leading figures as Dr. Vera Zlatareva, a graduate of the Law Faculty, the painters Elena Karamihailova, Elisaveta Konsulova-Vazova, Masha Uzunova, Donka Konstantinova, Sultana Suruzhon, Zoya Paprikova, Vera Lukova, Vera Nedkova and the writers Evgenia Mars, Dora Gabe and Elisaveta Bagryana received prominent place in the exposition. Several of the posters were devoted to the women architects who were severely ostracized by their guild – Elena Markova, Maria-Luisa Doseva, Mimi Berova-Hening, Ganka Gineva-Petrusheva, Richka Krastanova-Toneva, Stela Zaharieva-Bosolova, Maria Variklechkova, Elena Varakadzhieva, Luiba Toncheva. The last part of the exposition was devoted to the demise of the Union – the gradual politization of its activities and its leadership, the control exercised by the Security Police, the confiscation of its property, the scattering of its archives and the final closing down of the organization by the communist regime. The opening of the exposition coincided with one more important cultural event in Sofia – the re-opening of the permanent exposition of the National Gallery exhibiting some of the works of the members of the Painters’ Section of the Union of the Bulgarian Women with Higher Education. That made it possible for a lot of people to visit both expositions, which became one of the few “memory sites” of Bulgarian women in Sofia.